If you’re like most people, your home is the single largest financial investment of your life. Protecting that investment from threats such as termites is a high priority. On the other hand, you don’t want to take pest control measures that may be potentially harmful to human beings. Questions have been raised about the possible toxicity of a popular termite control method known as tenting. Let’s take a look at how safe this procedure really is. Termites are wood-eating insects that can seriously damage homes and any other structures made of wood. They are similar to ants in size and appearance. However, termites do not have the pinched-in waist and bent antennae that distinguish ants. One of the most visible signs of termites in your home (besides damage to the wood, of course) is discarded wings during the spring mating season. Ants never shed their wings. Tenting involves draping termite-infested structure with a tent and introducing poisons into the tent to kill the termites. The homeowners must carefully follow the exterminator's instructions and find other accommodations during the treatment cycle, which lasts 2-3 days. Why Is Termite Tenting a Cause for Concern? When the tent is removed, the poison escapes into the atmosphere. The chemicals used in this fumigation process, and other termite treatments, cause many experts to worry about environmental and physical health. Researchers at UC Irvine found that "an insecticide used to fumigate termite-infested buildings is a strong greenhouse gas that lives in the atmosphere nearly 10 times longer than previously thought. The chemical, sulfuryl fluoride (SF), stays in the atmosphere perhaps as long as 100 years. Earlier estimates projected its atmospheric lifetime at as low as five years, grossly underestimating the global warming potential." Not only does SF damage the environment, it has been implicated in human fatalities, even though the victims followed all safety precautions. 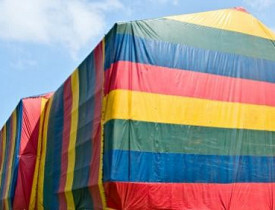 The Center for Disease Control reported that a Virginia couple died within seven days of having their home tented and fumigated. According to the CDC, the exterminators "failed to measure the air concentration of SF inside the home." Researchers and healthcare providers encourage using less toxic and harmful pesticides to eradicate termites. According to the University of Kentucky Entomology Department, there are two other options to tent treatment for termites: baiting and liquid soil application. The termite baiting process is complicated and, as with other termite treatments, should be handled by professionals only. Basically, the process involves placing paper or cardboard treated with a slow-acting poison. Termites are attracted to the bait, eat it, and eventually die. Termiticides applied to the soil around the infested property create a lasting poisonous barrier that prevents termites in the ground from entering a building. Termites already in the structure die when they cannot return to the soil. Premise® (imidacloprid -- implicated in the death of honeybees around the world), Termidor® (fipronil), and Phantom® (chlorfenapyr), are non-repellent and kill termites tunneling into the treatment zone. While there are several options available to eradicate termites, tenting is often recommended when there is widespread infestation. If tenting is your only option, be sure to work with a licensed, reliable pest control expert experienced in termite tenting. Follow his or her instructions and safety precautions carefully. Do not return to the property for any reason until a professional has tested the air to be certain that the sulfuryl fluoride concentration has returned to a safe level.